Hear the word facebook, I think all figured out because we already know that facebook is the largest social media is most widely used by internet users. Besides facebook is not only used by teenagers, research proves that children until the parents are also actively using facebook account respectively. This time the little boy can already selfie and upload photos on facebook, teens are also not to be outdone. It is part of the facilities and services provided by facebook, where we can share photos, videos, text and others on facebook. Discuss facebook and its features, certainly, we already know that facebook has equipped with video streaming. So we can see the video online and we can also upload the video via a PC or smartphone. Of course, this is the advantages when using facebook. But some of my friends complained that autoplay video on facebook often make internet quota was exhausted. It is true, I also feel it. That becomes the problem is the autoplay feature is on facebook. Because when we scroll down the look of facebook and once you find the video then it will play automatically. Then how to turn off autoplay facebook? The trick is not difficult. You can do now by following the steps below. The first step, open the Facebook application on a smartphone. Then tap the menu icon, such as the designated direction arrow number 1. 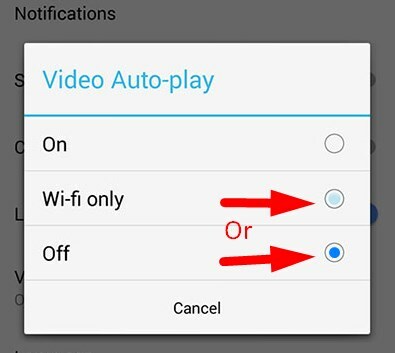 Next select and tap the menu "App Settings"
Then Tap options on "Video Auto-play"
Then select "Off" Or select "Wi-fi only" If you want to play the video automatically when connected to Wi-fi. 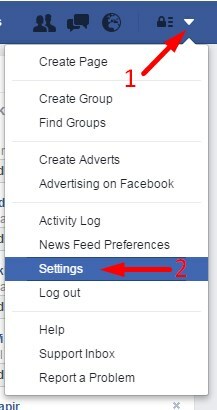 Please log in to your facebook account and then click the list menu on the top right-hand side of the facebook page. Then click Settings. On the page of "General Account Settings", please click the menu "Videos" that are on the left side of the Base menu. On the page "Video Settings" that contains two points setting "Video Default Quality" and "Auto-Play Video". Please focus on the second setting "Auto-Play Videos". There you will find the default setting. Please click and switch to Off. Facebook automatically saves your settings and video will not be played automatically as before. 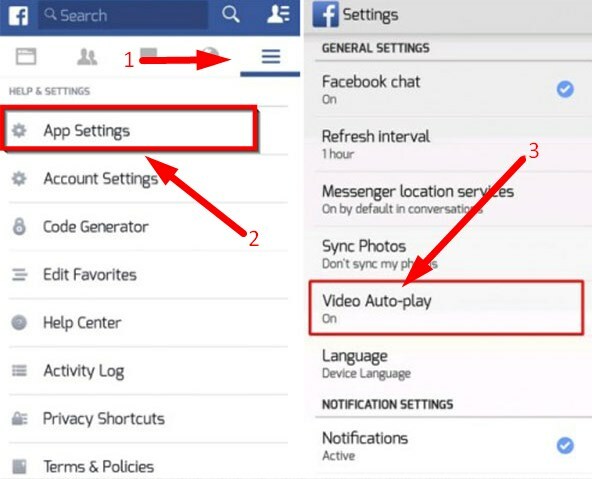 Now, you need not worry videos on your facebook account play automatically, because of the settings of the "Auto-Play Videos" in a state of turn off. So your internet quota will not be quickly exhausted. Hopefully, this article was useful to you and you can also share this tutorial to a variety of social media so that this article more useful.